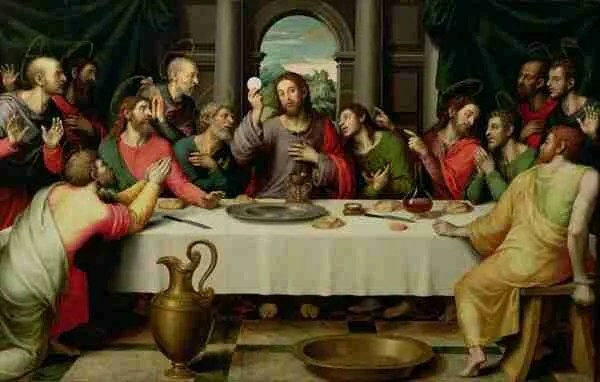 This scene is the beginning of the institution of what we refer to as Communion, or the Lord’s Supper. 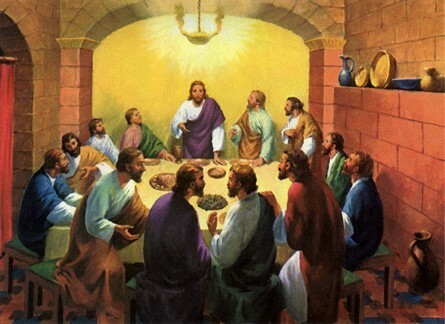 We have already discussed the meaning of the Passover feast. Now, the true passover Lamb is about to be slain. He instituted another feast, a wonderful memorial of His work on the cross. He called it the “new covenant,” or “new testament.” The Lord’s Supper embodies the fundamental truth of Christianity, in the same way that the Passover represented the fundamental truth of Judaism. The Lord’s Supper is a simple meal to remember what He did at Calvary; how His body was broken and His blood was shed for the remission of sin. In this new testament, His blood is shed for all; in the Judaic custom, the blood of the paschal lamb was shed only for the Jews. This is a new covenant indeed, including all who will come to Him for cleansing and forgiveness. In the book of Luke, we can read the words that make it clear that Jesus intended the observation of the Lord’s Supper to be a memorial, not a way of salvation or of forgiveness. As we take the bread and the wine, we are to think deeply on His sacrifice in our behalf and remember Him; to be thankful, to be humbled by His great love (Luke 22:19). Woe unto that Man. . . .
John 13:27 makes it clear that Satan had entered into Judas, and was controlling his mind and his heart. Judas had already opened himself to Satan’s control with his greed; he had allowed his greed to send him to bargain with the priests to identify Jesus for them for the price of a slave. Judas was never a true disciple, but a man who was looking out for his own interests. When it seemed that Jesus may be the One they all hoped would destroy Rome and establish His kingdom on earth, Judas was willing to follow Him. It was clear, now, however, that Jesus was going to fulfill His own words; He was going to die, and there would be no kingdom. No riches, no glory, no prominent place, no power. No loyalty, no commitment, no understanding of the One he was about to sell out. Truly, it would have been better for him if he had never been born. Eleven of the disciples felt great sorrow. One, perhaps, also felt sorrow. His sorrow, however, was tempered by greed and the guilty knowledge of what he had already done. I wonder if Judas, too, asked Jesus, “Lord, is it I?” Did he look into the eyes of the Son of God and know that Jesus already knew? Did he see judgment in those eyes? Was he afraid? Did he wish he could give the blood money back to the men who had given it to him? Did he realize he was selling Jesus for the mere price of a purchased slave? Did any of this go through his mind? We’ll see in verse 25 that Judas did indeed ask that question, but it seems he waited until everyone else had asked. It would seem that Jesus was giving Judas a last opportunity to repent, to confess what he had bargained to do, and to repent. Judas, however, remained silent. We can read in John 13 that Judas then accepted from the hands of the Lord a piece of bread dipped into the wine. I don’t know. I wasn’t there, and it is not recorded; but I can imagine that Judas’ eyes never left Jesus’ eyes as he put the sop into his mouth, chewed, and swallowed. What I can’t imagine is what he must have been thinking. I can imagine that in the first few seconds after Jesus made this startling statement, there was a thick and uneasy silence. Betray Him? What? How could that be? Who among these dedicated men who had followed Him for three years would even think of such a thing? No, it wasn’t possible! But they had learned that Jesus never spoke an unneccesary or false word, and their astonishment turned to great sorrow. Who? Who was the one who could not be trusted? Who among them would do such an evil thing? And I can imagine them lying their, reclining on the couches that were customary, looking a Jesus and trying not to look at each other. Sideways glances, downcast eyes, perhaps angry eyes, perhaps fearful eyes. One pair of eyes, though, must have glanced furtively at each of the other disciples, already knowing that the deed was in play, and wondering what his consequences would be. So. I’m tired of waiting for the dilatory daily prompt. Not checking again today. Anyway, we got a beautiful prompt overnight. I took this with my iPhone, from inside our dining room. It looks out on our back yard. We got about six inches, and the temperature right now is 33 degrees. Not bad, really. There are myriads of paeans written to the beauty of the snow. There are songs and poems and photographic essays, and I can’t (won’t) try to improve on any of them. There are also lots of things written about the horrors of the snow, the unrelenting cold, the dangers. Both are true. And both ideas have set my mind to work this morning.